The Party Silver Stylus Pen also comes with a built-in soft touch stylus makes, making this pen multi-functional! Great pen at a low price! It is sure to add value to any promotion! Plunger action retractable ballpoint. Black or Blue medium ballpoint ink cartridge. New addition to best selling Dart Family. Bright spring colors. This Flat Clip Pen stands out with its bright color options at a low price. Great value! Sleek retractable ballpoint pen with large flat clip. Retractable ballpoint pen. Metallic color options with silver accents. Retractable ballpoint pen with white barrel and colored accents. Retractable ballpoint pen with colored barrel and silver accents. Retractable ballpoint pen with upgraded Norwood Ink Steam Technology. A translucent version of our Promo Click pen. The Soca Pen is original with its own style and unique look! Great value for this high quality item. Stand out with this ballpoint pen that has a silver barrel and metallic accents! 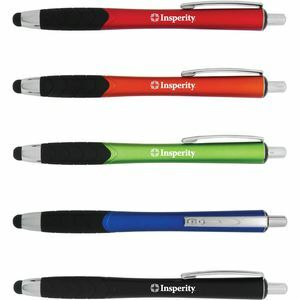 Feature your logo on one of these great pen designs! It is sure to add value to any promotion! This budget friendly pen meets every client's price point. Mix and Match your erasure and ferrule for extra color impact. Round wood barrel with #2 graphite lead. Cool frosted colors and the unique black grip make this pen an unforgettable promotion.